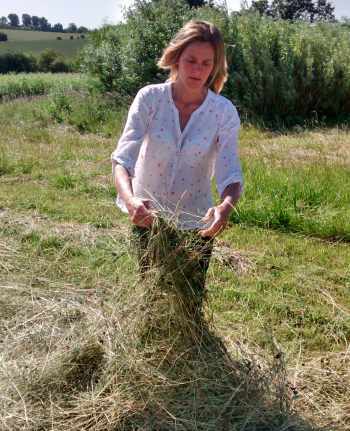 ..produced slowly using a system that minimises our impact on the environment, maximises the welfare of our animals and protects a beautiful piece of Bedfordshire. That’s the ideal anyway! will be available on Thursday 16 August 2018. To place an order, either download this order form, complete it and return it to us, ideally before Monday 6 August; or just tell us what you’d like to order by email or phone (01462 711815) and we’ll do the rest. If you’d like us to keep you informed, please contact us or why not complete the mailing list form to the right of this page or at the bottom if you’re on a mobile device? 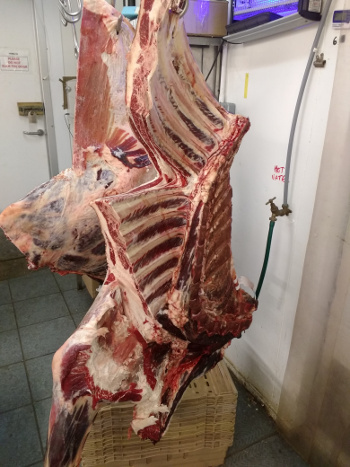 When a beast’s ready for the butchers, he goes off to be killed at Evans, Marston Moretaine, Beds and then currently the sides of beef (the two halves of the carcase) go to Franklins at Thorncote near Sandy, to be hung for about a month. In the mean time, we contact all our customers to request orders. 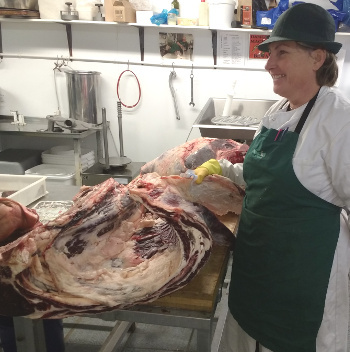 The beef is expertly cut and packed to customers’ specification by Adrian and Geoff at Franklyn’s and on a prearranged date customers collect from us or we can deliver locally. If you need advice about anything beef-related (you could try us on other matters but the accuracy of our responses might vary), please talk to us – we know a fair amount about the multitude of cuts available and how to cook them, now that we’ve been doing this for over ten years. If we don’t know, we’ll do whatever we can to find an answer for you. 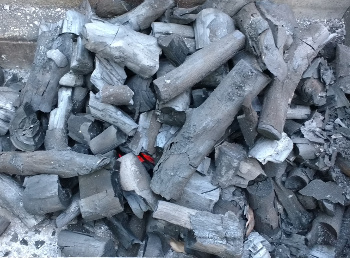 We have started producing lumpwood barbeque charcoal using some of the wood cut from Bottoms’ Corner and Centenary Wood. This is proving to be pretty ace at fueling those barbys this summer. This page focuses on our Red Poll beef. If you’d like to read about the farm and the cattle, click here. We are a very small producer and sell most of our beef to customers who live within a handful of miles. To make sure you hear when fresh beef will next be for sale, please click on the link to the right and sign up to receive news including our next beef dates. We offer gift certificates to redeem against any of our products, so if you are after a gift for someone who might appreciate some Wassledine Red Poll beef, find out more here. “We have eaten beef in many different places all over the world… ..and have to say that this was the best piece of meat we have ever eaten”. from a letter to the Gravenhurst Grapevine magazine. A very belated email to thank you for providing us with such delicious meat. The braising steak we had was the best I honestly have ever tasted – it was so tender. The beef burgers were exactly the same and it was the first time in my life that I have grilled burgers and not been left with a grill pan full of fat – I was amazed. In our extensive system, steers are ready for killing at 24-28 months, compared to more intensive practice where animals can be killed as young as 18 months. Our single suckler herd allows calves to suckle milk to around the age of seven or eight months and grow quickly in the most natural way possible. The herd grazes beautiful riverside meadows, that are in the Higher Level Stewardship Scheme, for most of the year, eating fresh grass and a wide range of herbage in the summer months and our own hay, and barley straw from neighbouring farms as well as a little bought-in feed, over the winter. All of which adds up to contented cattle. This is an area that we’ve previously steered clear of. That’s partly because we don’t wish to suggest anything about our beef that we don’t know to be true and partly because we don’t really want to be seen as part of a wild and radical fringe. Actually, we’re probably ok with the latter – just a bit worried about losing the support of some of our customers. It seems that the levels of omega-3 fatty acids in meat derived from animals that eat grass is higher than from those that are fed cereals. This doesn’t seem to be a controversial statement to make. Here’s a snippet from a research finding originally published in Nature, and cited at Wikipedia. “Omega 3 fatty acids are formed in the chloroplasts of green leaves and algae. While seaweeds and algae are the source of omega 3 fatty acids present in fish, grass is the source of omega 3 fatty acids present in grass fed meats. When cattle are taken off omega 3 fatty acid rich grass and shipped to a feedlot to be fattened on omega 3 fatty acid deficient grain, they begin losing their store of this beneficial fat. Each day that an animal spends in the feedlot, the amount of omega 3 fatty acids in its meat is diminished”. The controversial next step is the health claims made about omega-3 fatty acids. There’s more information in that Wiki reference above and loads of stuff, particularly American, elsewhere on the net. Still for all of you who pack away tons of oily fish every week, it might be that the occasional Wassledine steak or beef stew might be just what you need. Having watched the whole process of slaughter from start to finish (thanks to EBLEX and Dawn Meats, Cardington), we are convinced that the most stressful part of the process is transportation. Killing on the farm is not possible so the next best option is to make the journey to the slaughter house a short one. We use the services of Evans of Marston Moretaine, Bedfordshire, to kill our animals, a trip of about 12 miles which takes less than 30 minutes. 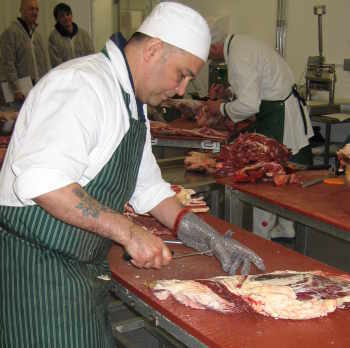 From the abattoir the carcase is collected by the butcher and hung for 3 – 4 weeks. This allows the beef to develop a fantastic depth of flavour. The butcher then cuts and packs the beef according to our customers’ orders. We receive meat back, all vacuum-packed, weighed and labelled ready for us to deliver direct to our local customers on the same day. Any not with customers on that day is frozen. If you would like to know when our beef will next be available and to be added to our customer list, have a look at the top of this page or contact us. We are currently a very small producer – killing only four or so animals each year, so we don’t always have fresh beef available. Once on our list, we will let you know when beef will next be available. You place an order and your fresh meat will be ready for collection or delivery on a specific date. We currently do not mail order meat. We can deliver free in Gravenhurst. Otherwise you will need to collect by prior arrangement. Available throughout the year – please contact us. Here are some recipes that we like, that have been recommended or that we just like the look of. Why not give one or two a try? Fancy sharing a favourite? We’d love to include yours here – let us know. 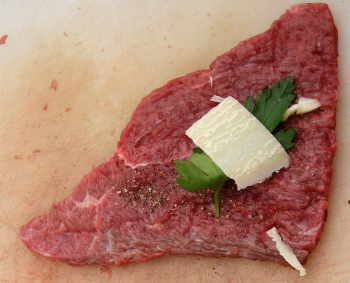 Elke’s Rinde rouladen – a German take on slow cooked, rolled topside steaks; similar to the ragu recipe below and just as good. Thanks Elke! Norma Vogt-Carney’s Pot Roast – We are grateful to Vicki Chappell-Apling, now of Cardington for passing on her step mother’s recipe for chuck or brisket, which sounds fantastic. Boiled beef and carrots – we know a song about that (well not really, but you know what I mean). Something very traditional to do with salt beef. Stuffed beef rolls in tomato ragu – apparently a very traditional Sunday lunch in southern Italy; absolutely fantastic! Bresaola – a ‘classic Italian salt-cure’ that makes something extremely special from a silverside joint. Quite a lengthy process but definitely worth it. Slow cooked silverside with bacon and Guinness – a simple, hearty pot roast of beef in Guinness that is a great no-fuss dish for larger gatherings of friends and family. A Day in the Woods – a recipe for health?